Well, Spring Break just flew by. Too bad we didn’t have Spring weather to go with it, but that’s the way it goes sometimes. I did make a Spring-like card last week, so I’ll share that. I die cut this beautiful butterfly out of vellum card stock with one of the Butterflies Thinlits dies. I just love the detail on this die. I use a layer of wax paper and a dryer sheet when cutting it out, and it come out cleanly and easily. 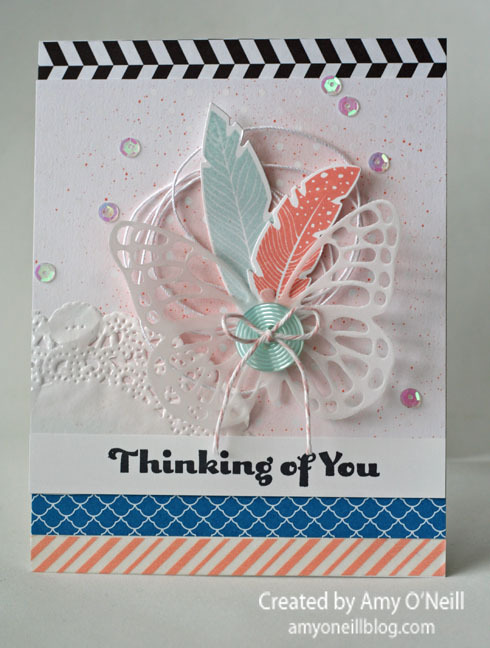 The layer behind the butterfly is a piece of the Irresistibly Yours dsp, which I sponged with a little bit of Pink Pirouette ink behind the butterfly. I also sprayed some Crisp Cantaloupe ink with my retired spritzer tool. 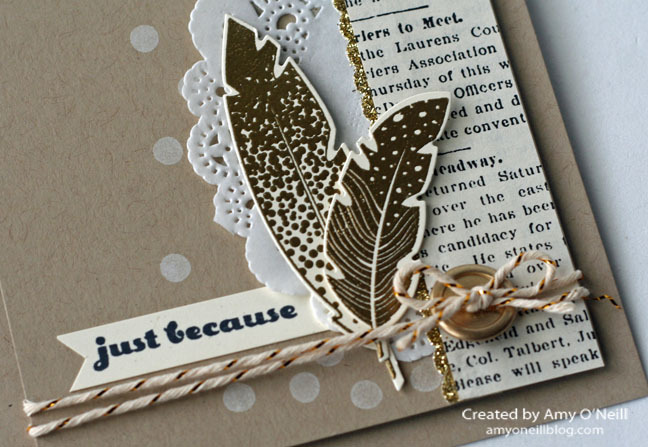 I added a couple of feathers from the Four Feathers stamp set and cut them out with the Feathers Framelits dies. They are stamped with Crisp Cantaloupe and Soft Sky ink. This was definitely an “add a little bit of this and a little bit of that” kind of card. Sometimes it’s fun to just mix and match away to one’s heart’s content. 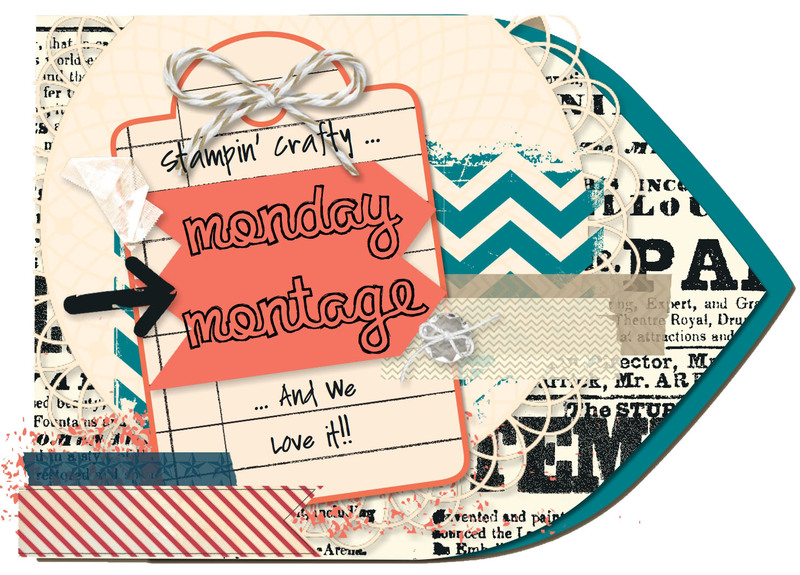 Welcome back for another Monday Montage blog hop! There are ten different stampers who are excited to share their creations with you. All you have to do is click on the arrows at the bottom of each post to navigate your way through the hop. 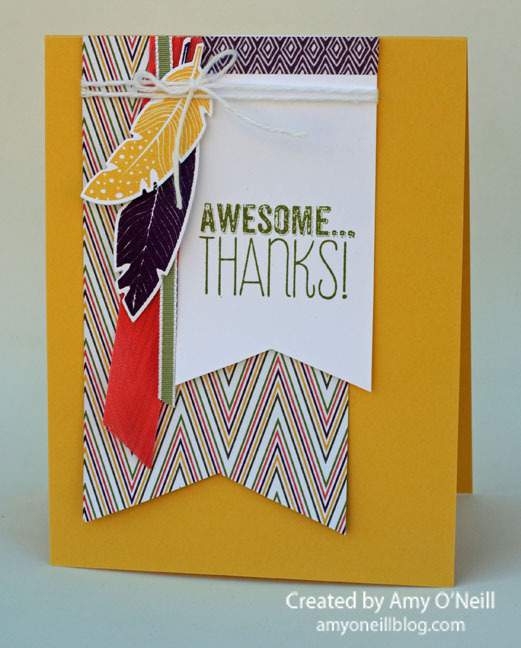 I needed a thank you card and I hadn’t used the Four Feathers stamp set in a while, so I pulled it out. I paired it with the Yippee-Skippee! sentiment set and used some of the Park Lane dsp. 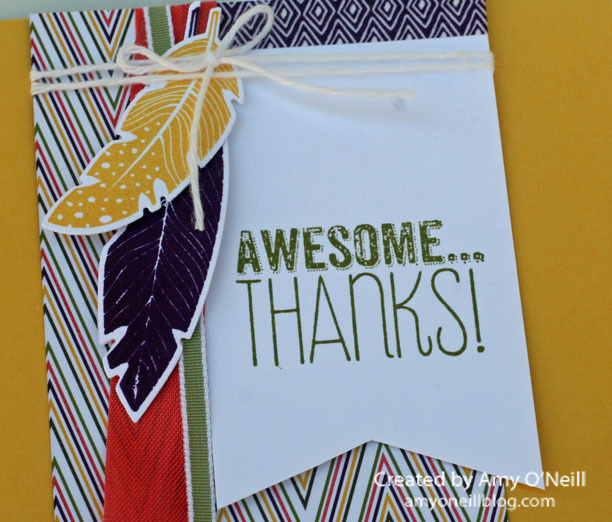 I also used a little strip of the Blackberry Bliss Color Me Autumn washi tape at the top of the sentiment banner. I love using washi tape! It adds an instant pop of color in such a fun way. You’re ready to hop on over to the super talented Breelin Renwick’s blog for an instant dose of inspiration. If you’d rather work your way backwards, you can hop backwards to the always creative Wendy Weixler’s blog. Either way, make sure to work you way through the other nine blogs so you don’t miss a thing. I hope you’ve had a good weekend, and that you’ve been able to spend some time stamping. We have another Monday Montage blog hop ready for you, so we’d love to share with you what we have been working on lately. Just click on the links at the end of each post to navigate your way through all ten blogs involved in the hop. I recently attended a Unite & Excite event, which is a get together for Stampin’ Up! demonstrators to network and share ideas. And as with any Stampin’ Up! event, there was lots of swapping going on. This is the swap I created for the event. It isn’t my normal style in that there isn’t much color. I decided to let all of the gold accents shine against a base of neutral colors. It’s nice to mix it up every once in a while. 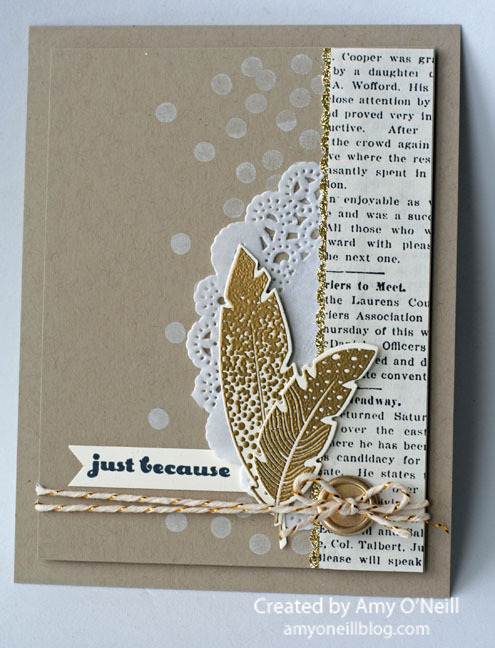 I embossed the feathers from Four Feathers with Gold Stampin’ Emboss Powder and then cut them out with the coordinating framelits. I added a little touch of Gold Glimmer Paper, Gold Metallic Baker’s Twine, and Gold Basic Metal Buttons as well. 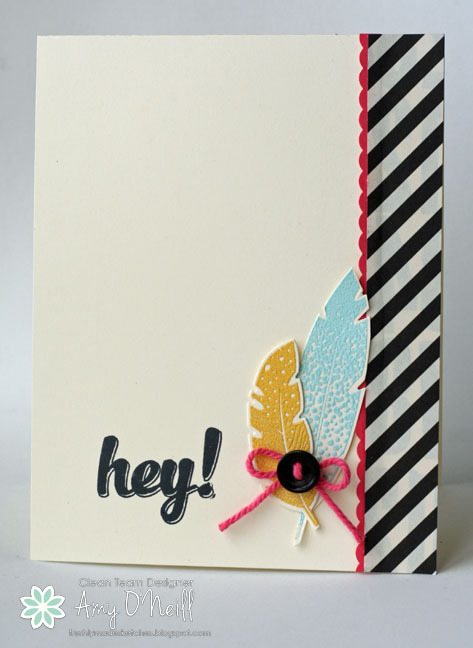 The background was stamped with Whisper White Craft ink using a stamp from the Dotty Angles stamp set. The dsp is from the Typeset dsp package (I seriously love this paper). The sentiment is from the set And Many More. You are ready to venture on to Breelin Renwick’s blog to be amazed by her creative talent. If you prefer to work your way backwards, you can click on the “back” button to visit the inspiring Wendy Weixler. Either way, be sure to work your way through all ten blogs. It’s the last Wednesday of Summer vacation for my kids, and I think I’m probably sadder about that than they are. I love having them home for the Summer, and I love the relaxed schedule that Summer provides. I’ll have one in high school, one in middle school, and one in elementary school again this year. And that means three different start times, and lots of activities to keep track of. Of course, Wednesday also means it’s time for a new sketch at Freshly Made Sketches. And this week the always delightful and majorly talented, Linda Callahan has a fabulous sketch for us. One of the new sets in the upcoming Holiday catalog that I love is the Four Feathers set. 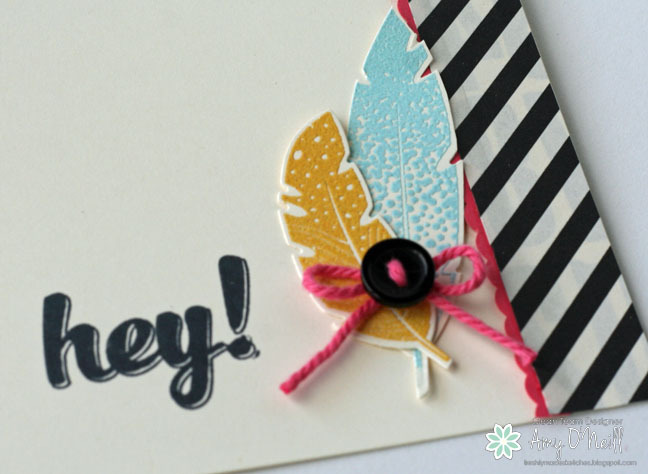 Just like the name says, there are four fabulous feather stamps in this set. And to make it even more fabulous, there is a coordinating framelits set. I love that! I decided to flip the sketch over on its side to better accommodate the feathers. I embossed them with Pool Party and Crushed Curry embossing powders, and added a little Strawberry Slush Thick Baker’s Twine on the black button. The sentiment is from the Hi There stamp set. I hope you can find some time to join us and play along with this challenge. We always love to see what you make. You can drop by the Freshly Made Sketches site to get some inspiration from the design team. They always inspire me!